ABOUT THE EXPEDITION | Samotnie Na Biegun.pl Wyprawa Antarktyczna. Through the coldest, driest, and most windy continent – the Antarctic. Solo, unassisted and without external support. I will walk from the edge of the continent, through the Antarctic ice sheet, to the South Pole. 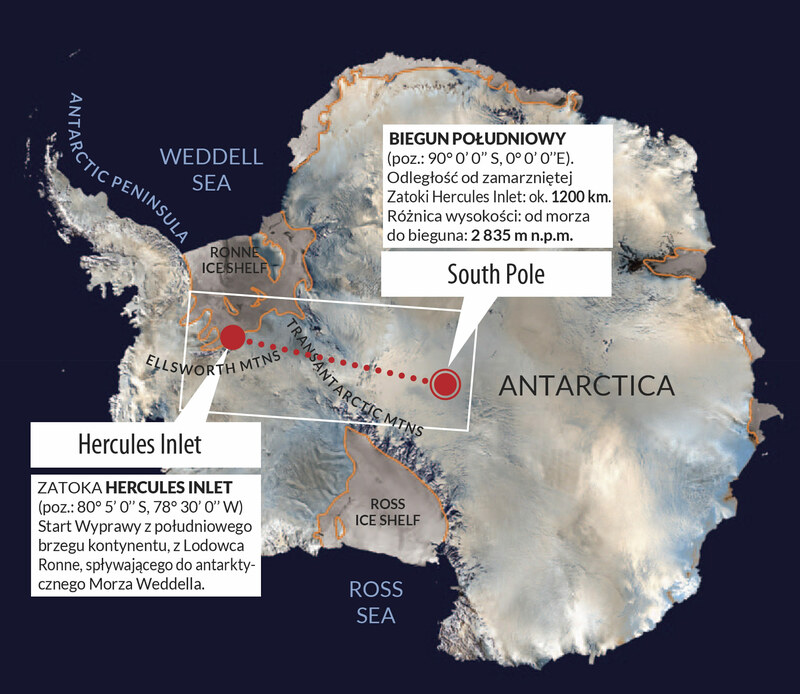 I will start in the Hercules Inlet, at the edge of the Ronne Ice Shelf, next to the Ellsworth Mountains (with the highest peak of the Antarctic, Mount Vinson, 4982 m/16 050 ft. above sea level). I will climb up from the Weddell Sea level to the Antarctic plateau, gradually reaching 2 835 m/ 9 301 ft. above sea level at the South Pole (which feels like 3610 m (11,843 ft.) in the mountains in Europe – the atmosphere layer is thinner and the air pressure is lower over the South Pole). Half way I will cross between the Thiel and Penansola Mountains, getting to the other side of the Transantarctic Mountains which divide East Antarctica and West Antarctica. I will ski for approximately 1200 km during 50-60 days, and pull a 100kg+ sled with all my supplies of food and equipment needed to survive in the Antarctic for 2 months. Hurricane winds of up to 100km/h that bring blizzards, whiteout, and temperature drops to -30C (-22F), and ice crevasses – in particular close to Hercules Inlet and Thiel Mountains) -will be the biggest threat. In those latitudes one has to be self-sufficient, deal with every fault on their own, and be prepared for sudden changes in weather. Marek Kaminski is the only Pole who reached the South Pole in a solo expedition (in 1995 and in 1997, during an attempted traverse of the Antarctic).